Safe Sun Absolute anti-tan gel is a medium intensity cooling sunscreen gel especially formulated for oily & combination skin. 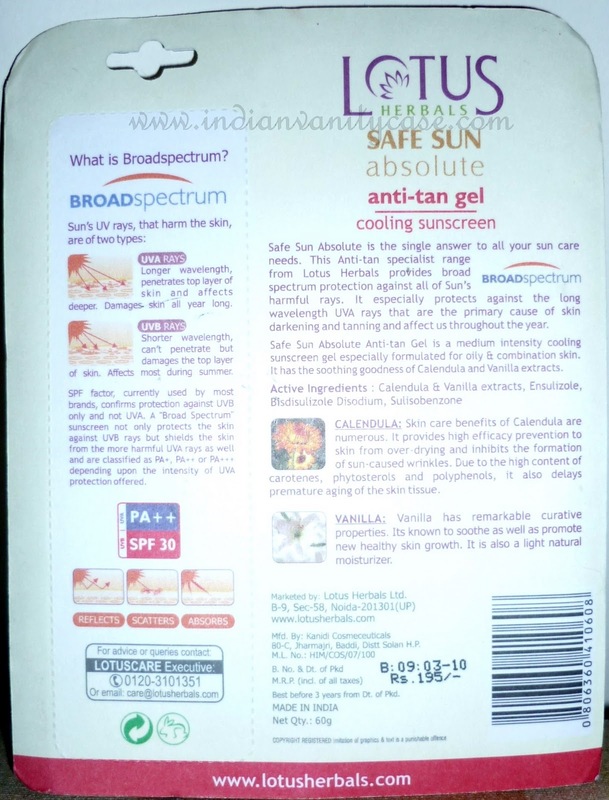 It especially protects against the long wavelength UVA rays that are the primary cause of skin darkening and tanning. It has the soothing goodness of Calendula and Vanilla extracts. It has a strong flowery-menthol fragrance, which some might find a bit overpowering at first, but it goes away in, like 30 seconds. So, it's not something to worry about. As for the cooling effect, it is there. Weirdly so. Have you ever used Dermi Cool body powder? Well, it feels just like that. It's more of a menthol/minty cooling, not a splash-of-cold water cooling. I hope that makes sense to you =D . Also, this 'cooling' sensation doesn't last for long, I'd say I feel it for only about 5 mins. But all this doesn't bother me at all. The best thing about this (for me) is ~ I can re-apply it on top of my make-up during the day and it will not make my face look blotchy or mess up my base. I love that. I needed that. If you don't want to mess up your blush, I suggest that you re-apply the sunscreen by slapping it on to your whole face instead of applying it like you normally would. 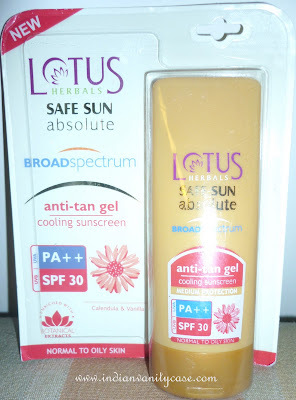 Lotus Anti-tan Creme Intensive Sunblock & Skin Lightening SPF 50 Review coming up next. This would serve me well! It gets so incredibly hot where I live. i hope they bring this brand to my country soon. we only have limited brands that has broad spectrum protection such as vmv hypoallergenics. I get here in your blog inspirations. i think the price is pretty good for a sunscreen with all those plus points!! it would be great for someone with non-dry skin. Sounds good to me, especially that part about re-application without messing up the makeup! 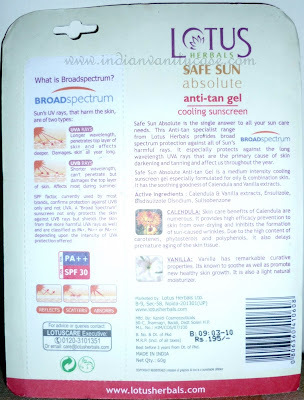 well....i have oily skin...i am suing Lotus SPF15 (gel)...but i am not happy with result after applying it my face looks shine (not oily).... but after few hours my face looks so so oily....i don't know when i am gona get right product for me. I am using this sunscreen currently. Love the fragrance and the strong cooling sensation. But it does make my face feel dry, ( even in summer ) so I have to top it up with a moisturizer.